Governor Steve Bullock welcomed a Capitol full of people to celebrate National Ag Day, March 18, with state legislators, the department of agriculture, state agriculture organizations, and agriculture advocates. "It's a great day to celebrate National Ag Day in Montana, and remember all that farmers and ranchers do to ensure that we have abundant, safe, healthy food to eat. This is a day where we give thanks and celebrate food produced right here in Montana," said Governor Steve Bullock. The semi-annual luncheon featured an all-Montana meal that included beef brisket, baked ham, roasted lamb, chickpea lime salad, local potato salad, wheat bread, brownies and honey donated or purchased locally. 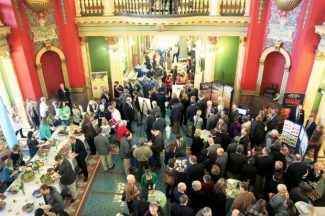 The event also hosted 16 agriculture organizations that set up booths throughout the rotunda providing an opportunity to showcase agriculture to legislators in attendance. "Agriculture in Montana is growing and innovating every day in what we grow and how we grow it. Montana is now a leader in the production of dry peas and lentils that are a great rotational crop for wheat and enhance soil. We also lead the nation in barley acres planted and our cattle genetics are in demand around the world," said Director Ron de Yong. Revised numbers provided by USDA Economic Research Service show the value of Montana's agricultural production was $5.3 billion in 2013, with over 28,000 farms or ranches across the state of which 97% are family farms. Montana has nearly 2.5 cows for every person in the state, and is a leading producer of wheat, barley, dry peas, lentils, sugar beets, and honey. Wheat is Montana's number one export, with approximately 75% exported to Asian markets. Montana is known around the world for our high quality grains, pulse crops, seed potatoes, sugar beets, sweet cherries, and beef. For a complete list of rankings and more information on Montana agriculture visit the National Agriculture Statistics Service's annual state bulletin. National Ag Day is organized by the Agriculture Council of America to increase the public's awareness of agriculture's role in modern society.